At Fragrance Heaven, we strive to be as accurate as possible in all product descriptions however we do not guarantee our descriptions are accurate, complete, or error-free. The information, pricing and descriptions are thus subject to change without notice and we reserve the right to cancel any orders associated with an error. Please note that a fragrance bottles shape/size/features may vary depending on size or type (EDTS, EDPS etc) or may be completely changed/updated over time. We can only display one picture per for any particular fragrance in our description and thus refunds/exchanges cannot be given on such grounds where the bottle displayed differs to the one you have received. Please understand that typographical errors may arise and that colours/shapes may vary from monitor to monitor. If you feel you have received a product that is not as described, please contact us as info@fragranceheaven.com.au for warrant on an exchange/refund. To order, simply browse throughout our extensive selection and add your desired products into your basket. You may update the item quantity, remove an item or add any additional items into your basket at any given time. You will be prompted if a product is not available in the desired quantity. If you cannot find a particular product you are looking for, please email us at info@fragranceheaven.com.au and we will do our best to fulfill your request. Once you have completed your shopping, proceed to the Checkout page where you will be prompted to log into your existing account or to create an account for first time users. From here, please make you payment and confirm your order. You will then receive a confirmation e-mail containing your unique order number. If you select BPay or POSTbillpay as your payment method, a BPay/POSTbillpay invoice will be sent to your email address within 24 hours of order placement. Once we have processed and packaged your order, any dispatch or tracking details will be e-mailed to you immediately after your order has been sent. - Nothing to pay today. 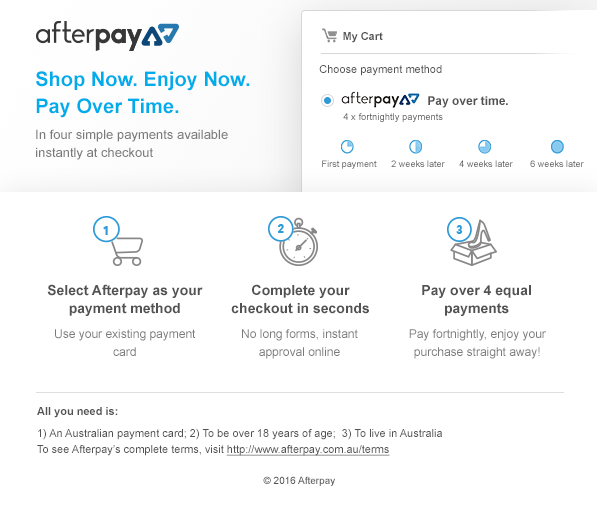 - AfterPay allows you to pay off your purchase in equal fortnightly payments. Fragrance Heaven accepts all major credit cards including MasterCard, Visa, American Express and Diners Club International. We also accept credit card payments through Paypal™, the world's leading online merchant. Our registered PayPal™ address is paypal@fragranceheaven.com.au . We are PayPal™ Verified member. If your PayPal payment is funded by an e-cheque, this may substantially delay processing your order while payment clears. Fragrance Heaven accepts online payments via the BPay payment system. Simply select the BPay method of payment in the checkout screen and we will email you a BPay invoice within 24 hours. From here, you will need to contact your financial institution by phone or internet banking and quote our biller code and order reference number to make your BPAY payment. Once you payment has been cleared (up to 2 business days), your order will then be dispatched. For more information on BPAY, please visit www.bpay.com.au. Fragrance Heaven accepts online payments via the POSTbillpay payment system. Simply select the POSTbillpay method of payment in the checkout screen and we will email you a POSTbillpay invoice within 24 hours. From here, simply present your invoice, together with your cheque, money order, cash or giroPost withdrawal, to a counter officer at any post office and your payment is complete. POSTbillpay’s Australia-wide network of 3900 outlets in nearly every town, city and suburb provides you with direct access to a bill-paying facility which has been built for the benefit of all Australians. Once you payment has been cleared (up to 2 business days), your order will then be dispatched. For more information on POSTbillpay, please visit www.postbillpay.com.au. If you have an objection to any of these payment methods, please email us info@fragranceheaven.com.au to we will try to arrange an alternative payment method. We operate a Symantec™ 256-bit S.S.L. (Secure Socket Layer) security system for all our online transactions. This means any personal data (name, address, credit card information) which we collect is fully encrypted and protected so it cannot be read or obtained by anyone on the internet. We also run a daily malware scan which ensures our website is virus-free. Our online transactions are processed under a secure connection by eWAY and Commonwealth Bank. For more information on eWAY, Australia 's leading payment gateway, please visit www.eway.com.au. Please note: Fragrance Heaven reserves the right to request further identification for additional security reference checks such as telephone/ID verification. We also reserve the right to cancel any orders made by customers who refuse to comply with our security reference checks. All items are professionally packaged and are usually dispatched within 24-48 hours of payment clearance, with the exception of weekends and public holidays where they will be dispatched on the next business day. Peak periods such as Christmas, Valentine's Day. Mother's/Father's Day and sale periods may also cause further dispatch delay. The above delivery times given are a GUIDE ONLY and Fragrance Heaven will not be liable for any circumstance which may arise if delivery falls outside the delivery guide. Under no circumstance will Fragrance Heaven be liable for deliveries considered "late" if personal deadlines are set. We highly recommend provide your work address or an address were you will be present to receive your delivery as a signature is required. Fragrance Heaven will not liable for any delays that arise for not being able to sign upon delivery.Please note that under no circumstance will Fragrance Heaven accept requests to "leave parcels behind" without a signature. A signature is required for each and every delivery- this is to protect both yourself and ourselves from any dishonesty. If you require a delivery to a PO Box, your PO Box will be carded upon arrival and your parcel can be collected from your post office counter. All goods are dispatched in compliance with Australia Post's Dangerous Goods Policies. Our contract with Australia Post legally permits us to send Class 3 Dangerous Goods (perfume & fragrance) by approved road transport only. Important note: Please be accurate when supplying delivery address details as Fragrance Heaven will not be liable for any charges associated with return and re-delivery charges, or be liable for any loss of products as a result of incorrect/insufficient delivery details. Insurance is completely void under the circumstance where an incomplete or incorrect address is provided (this includes not supplying a business name if delivery is being sent to a business address). Insurance is also void if a redirect is requested and fails. Fragrance Heaven does not currently ship outside of Australia due to Dangerous Goods Policies. Please not we DO NOT refund/exchange for any issues associated with personal fragrance taste. If you find a product to be defective once opened you will be provided with a full refund/exchange upon inspection. All defective items must be returned within 30 days, after which they will not be accepted. For all returns, please email us at: info@fragranceheaven.com.au with your name, email address, order number and reason for return. From here, we will inform you of a return address and any refund details. All returns are inspected within 24 hours of return and if warranted, refunds issued immediately after. Unfortunately, due to the set-up of our payment gateway we are unable to cancel an order once it has been placed. Please select your products carefully. All products featured on our website are subject to availability. On the rare occasion where a product ordered is out of stock once it has been paid for, you will be contacted immediately via email or telephone. You will then be given the option of refund, exchange or to place a product on back-order. Privacy and protection of any personal information is taken seriously at Fragrance Heaven. We do not sell, rent or distribute your personal information to third parties and comply with the requirements of the Privacy Act 1988(Cth) incorporating the Privacy Amendment (Private Sector) Act 2000 (Cth). At Fragrance Heaven, security is our most important priority. We have invested heavily to ensure your shopping experience safe, secure and worry free. We operate a GeoTrust™ S.S.L. (Secure Socket Layer) security program for all our online transactions which guarantees your safety and security. This means any personal data (name, address, credit card information) which we collect is fully encrypted and protected so it cannot be read or obtained by anyone on the internet. Although Fragrance Heaven employs the latest in Secure Sockets Layer (SSL) technology and online transaction security, we will not be responsible for any damages, consequential losses (whether direct or indirect) suffered by a customer whose credit card is fraudulently used or is used in an unauthorised manner. All screens appearing on our website including graphics, text, design, button icons, logos, images, and icons, as well as their selection, assembly, and arrangement, are the sole property of Fragrance Heaven and are protected by Australian and international copyright laws. Any modification, reproduction, uploading, posting, transmission, or distribution of the content contained within our website, without Fragrance Heavens written permission, is strictly prohibited and may lead to legal prosecution. Trade marks, copyright, brand names, product names, and company names of appearing on this website are the property of their respective owners. Fragrance Heaven does not claim to own any of these trade marks, copyright, brand names, product names, and company names nor does it claim that Fragrance Heaven is related to, endorsed by, or in any other way connected or associated with these companies. THE INFORMATION FROM OR THROUGH THIS SITE IS PROVIDED "AS-IS," "AS AVAILABLE," AND ALL WARRANTIES, EXPRESS OR IMPLIED, ARE DISCLAIMED (INCLUDING BUT NOT LIMITED TO THE DISCLAIMER OF ANY IMPLIED WARRANTIES OF MERCHANTABILITY AND FITNESS FOR A PARTICULAR PURPOSE). THE INFORMATION MAY CONTAIN ERRORS, PROBLEMS OR OTHER LIMITATIONS. OUR SOLE AND ENTIRE MAXIMUM LIABILITY FOR ANY INACCURATE INFORMATION, FOR ANY REASON, AND USER'S SOLE AND EXCLUSIVE REMEDY FOR ANY CAUSE WHATSOEVER, SHALL BE LIMITED TO THE AMOUNT PAID BY THE CUSTOMER FOR THE INFORMATION RECEIVED (IF ANY). WE ARE NOT LIABLE FOR ANY INDIRECT, SPECIAL, INCIDENTAL, OR CONSEQUENTIAL DAMAGES (INCLUDING DAMAGES FOR LOSS OF BUSINESS, LOSS OF GOODS, LOSS OF PROFITS, LITIGATION, OR THE LIKE). WHETHER BASED ON BREACH OF CONTRACT, BREACH OF WARRANTY, TORT (INCLUDING NEGLIGENCE), PRODUCT LIABILITY OR OTHERWISE, EVEN IF ADVISED OF THE POSSIBILITY OF SUCH DAMAGE. THE LIMITATIONS OF DAMAGES SET FORTH ABOVE ARE FUNDAMENTAL ELEMENTS OF THE BASIS OF THE BARGAIN BETWEEN US AND YOU. WE WOULD NOT PROVIDE THIS SITE AND INFORMATION WITHOUT SUCH LIMITATIONS. NO REPRESENTATIONS, WARRANTIES OR GUARANTEES WHATSOEVER ARE MADE AS TO THE ACCURACY, ADEQUACY, RELIABILITY, CURRENTNESS, COMPLETENESS, SUITABILITY OR APPLICABILITY OF THE INFORMATION TO A PARTICULAR SITUATION. Unfortunately, due to the set-up of our order process we are unable to cancel an order once it has been placed. Please select your products carefully.